Milan Expo 2015 kicked off on 1 May, with a lavish opening ceremony that featured a performance by Andrea Bocelli and a video link with the Pope. It’s a huge event, featuring 145 participating countries and expecting around 20 million visitors over the course of its six month run. The theme for this year’s expo is Feeding the Planet, Energy for Life, and it aims to explore issues around agriculture, sustainable development and energy conservation, with participating countries showcasing their solutions. The road to opening certainly hasn’t been smooth, with problems including cost overruns, accusations of corruption, construction delays and violent anti-globalisation protests. While critics of the Expo have accused it of being wasteful (masterplanner Jacques Herzog recently branded it a vanity fair), its supporters say it will help raise awareness of the vital issues of food scarcity, global hunger, climate change and population growth, and will leave a positive legacy. 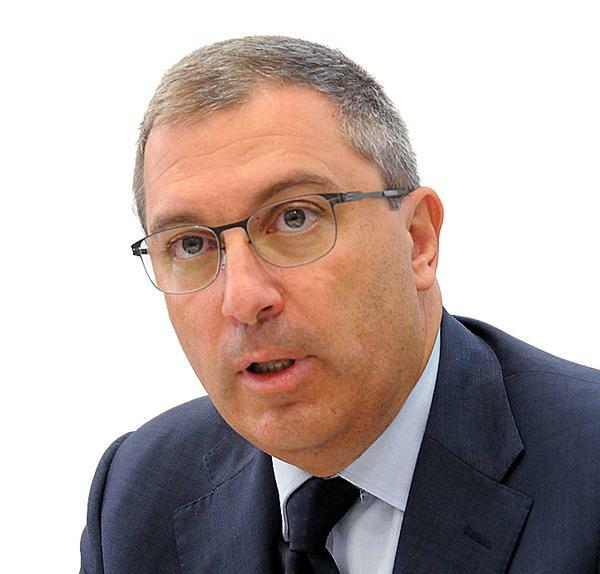 It is also set to boost Italy’s economy – Italy’s Chamber of Commerce and the University Bocconi in Milan have estimated that the expo is worth an extra E10bn ($11bn, £7.3bn) to the Italian economy and E5bn to the tourism sector. Public investment in the Expo is E1.3bn; according to the organisers, operating costs of E800m are balanced with E800m in revenues received from sponsors, ticket sales and merchandise. 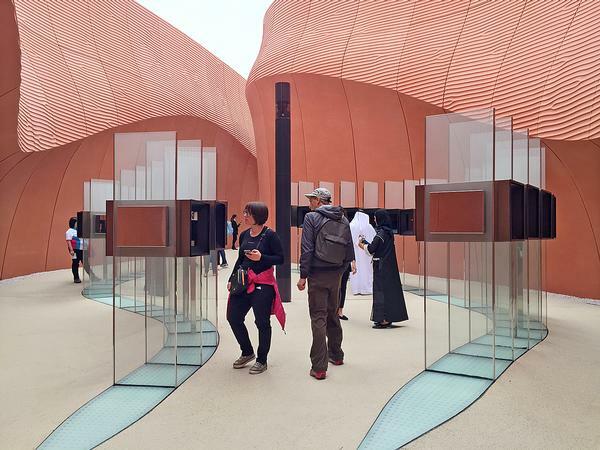 As for the architecture, there are a whole range of varied and innovative designs on show, with pavilion designers including Daniel Libeskind (Vanke pavilion), Foster + Partners (UAE pavilion) and Herzog & de Meuron (Slow Food Pavilion). The Expo content has been divided into two formats: experiences and focuses. Experiences are aimed at people looking for fun and entertainment, while the focuses are in-depth analyses of the challenges of feeding the planet. 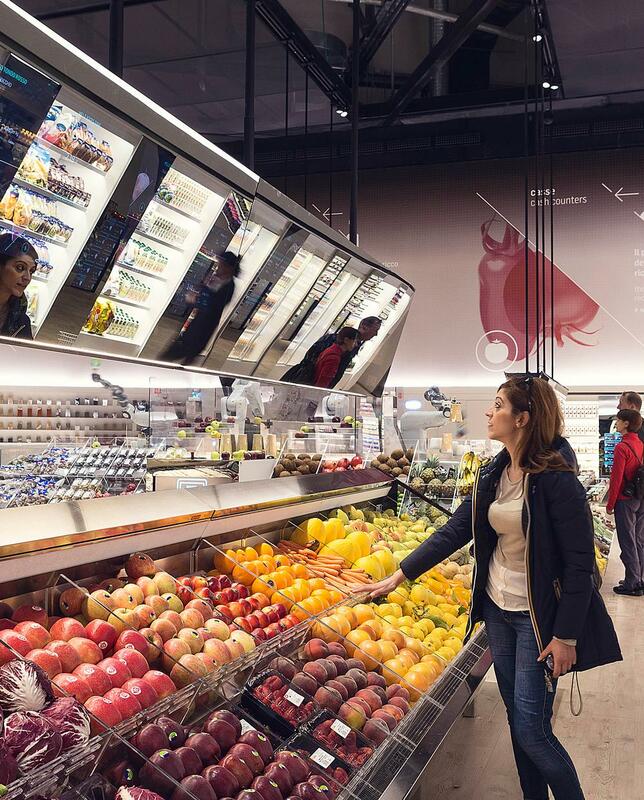 Experiences include the Supermarket of the Future, showing how food might one day be produced and consumed, the food on site and live entertainment including Cirque du Soleil and music concerts. The ‘focuses’ meanwhile, are divided into three topics, each with a programme of debates, talks and conferences. The second focus looks at food groups and agricultural zones and the third looks at special projects such as the UN’s Blue Spoon against Hunger installation. How did you decide on the theme for the Expo? 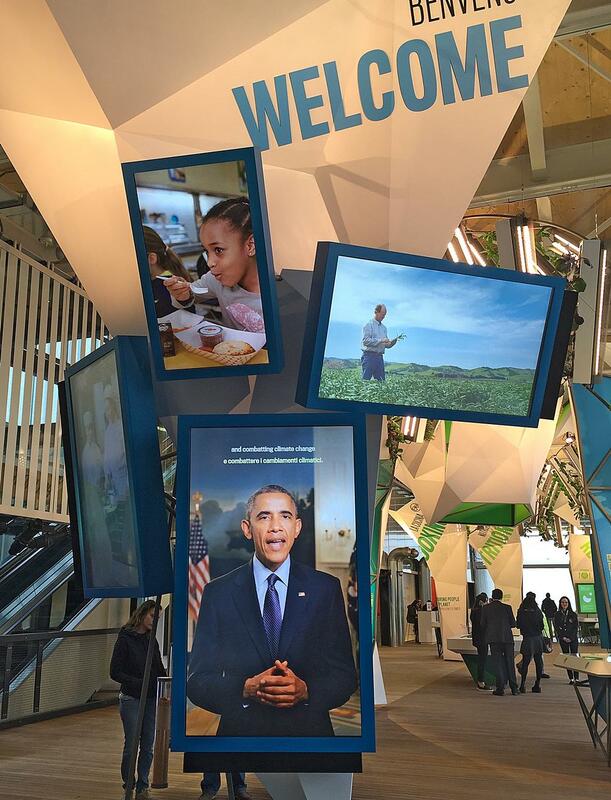 Expo Milano 2015 provides an opportunity to reflect upon, and seek solutions to, the contradictions of our world. On the one hand, there are the hungry and, on the other, there are those who die from ailments linked to poor nutrition or too much food. In addition, about 1.3bn tons of foods are wasted every year. For these reasons, we need to make conscious political choices, develop sustainable lifestyles, and use the best technology to create a balance between the availability and the consumption of resources. 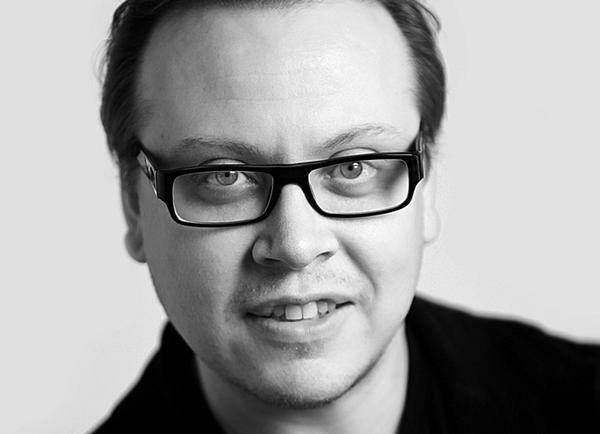 What is the role of architecture at the Expo? 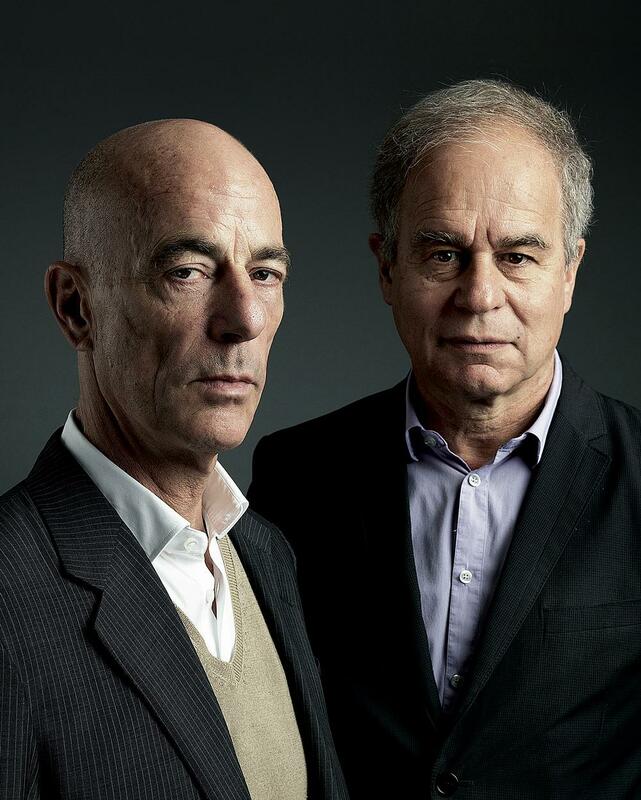 The exhibition site was designed by internationally renowned architects Stefano Boeri, Ricky Burdett and Jacques Herzog. Eco-friendly and recyclable national pavilions and thematic areas were designed by the world’s foremost architects — from Norman Foster to Daniel Libeskind and Michele De Lucchi. The number of self-built national pavilions – 53 – is a record in the history of universal exhibitions. How will this Expo stand out? 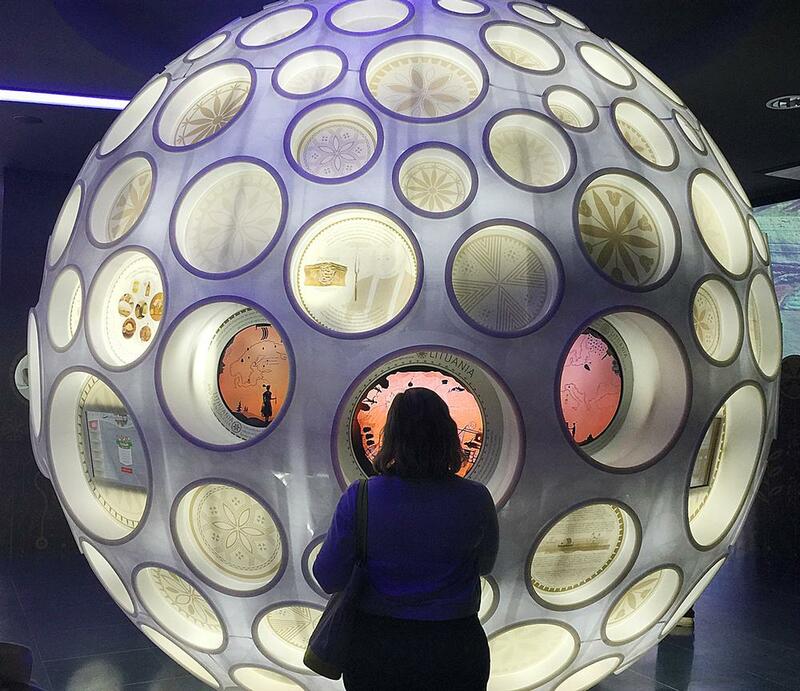 Expo Milano 2015 is all about innovations. For the first time in its centuries-old history, the Expo won’t simply be an exhibition of human progress, but the opportunity to promote discussion and cooperation between nations, organisations and businesses to develop joint strategies to improve the quality of life and support the environment. 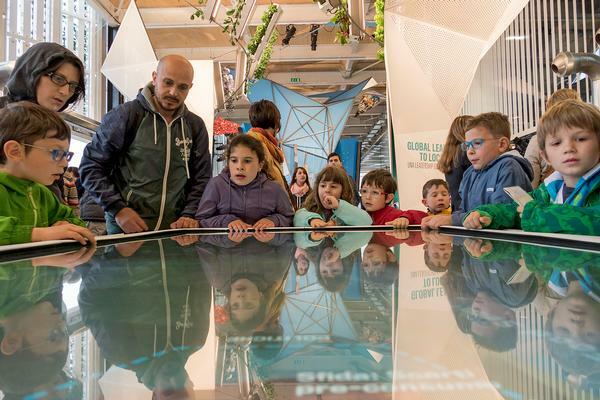 One of the brightest examples of innovations introduced by Expo Milano 2015 is the concept of clusters. Clusters represent shared exhibition areas dedicated to countries that – for various reasons – do not have their own pavilion. They are located throughout the site and allow the countries to represent their food history, culture and traditions. 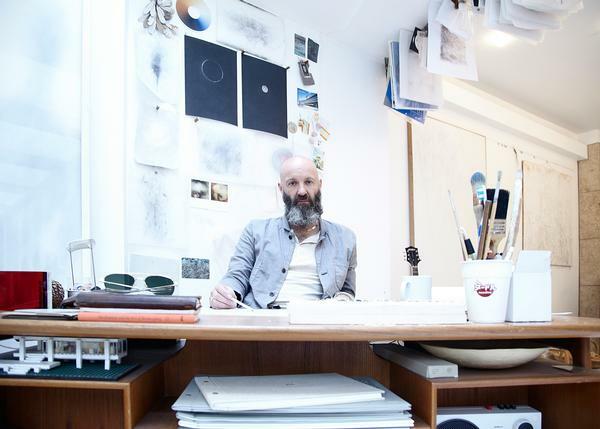 Inspired by the idea of the honeybee and its role in the wellbeing of the planet, the 1,910sq m UK Pavilion has been designed by a team led by artist Wolfgang Buttress, with BDP providing architectural input, and construction and manufacture by Stage One. The pavilion consists of five areas – the Orchard, the Meadow, the Terrace, the Hive and the Architectural Programme. Visitors are met by an orchard of British fruit trees, surrounded by walls designed to evoke an English country garden. From there they walk through a steel corridor to the 40m long meadow, featuring plants and flowers, with amphitheatre seating at one end. The hive is, of course, the star of the show. 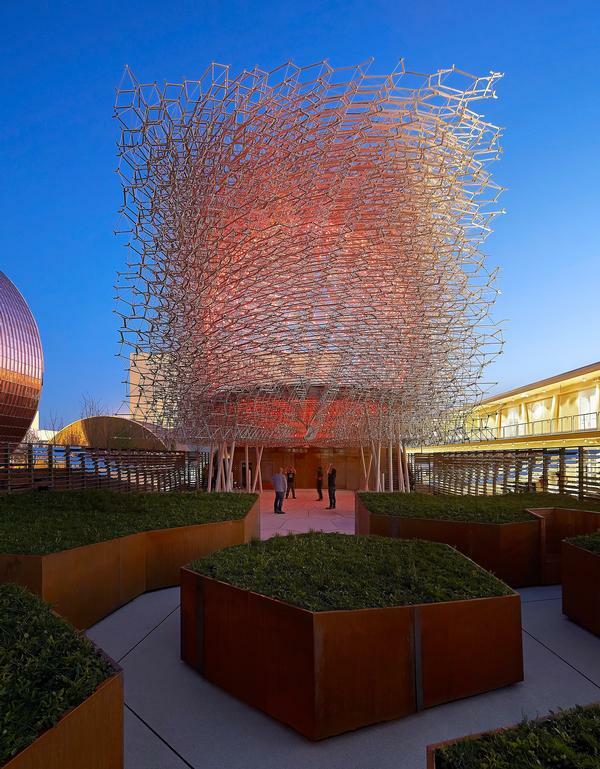 A 14m x 14m x 14m 3D honeycomb structure made from separate aluminium components, it features a sheltered piazza area underneath, allowing visitors to enter and experience the beehive from within. The structure is connected to a real beehive in the UK, and a series of audiovisual devices allow it to pulse and buzz in accordance with the activity of the real bees. Accelerometers – used to measure the acceleration of a moving body – measure the vibrational activity of the bees and these signals are fed into LED lights embedded within the structure to generate a visual representation of their activity. A 300sq m podium houses the terrace, which features a bar and acts as a social space, as well as proving access to the hive. How was the idea for the UK Pavilion born? The form and idea originated from dreaming and a hand drawn sketch. I wanted to find a simple metaphor for the state of the planet in 2015. The bee can be seen as a sentinel for the health of the world. Pollination is essential to the wellbeing and feeding of the planet. I wanted to express something that’s universal, and that goes beyond language, age and intellect. The role of wider ecosystems in our food chain is very significant, but is often overlooked in favour of a more anthropocentric emphasis. Many people are aware that the honey bee is facing a crisis in recent years, I wanted to highlight the significance of this issue for food security. We got in touch with biophysicist Dr. Martin Bencsik, who is doing some incredible research into the honey bee. By measuring vibrational signals he can interpret their language and communications, which is an amazing step in understanding their behaviour and more importantly how our behaviour affects bees. Our central idea was to use this technique to connect a real beehive in the UK to our pavilion in Milan. Digital signals from the bees are streamed in real-time and expressed to visitors through light and sound. What is the aim of the pavilion? I wanted to create something reserved and conscious of its context, yet at the same time innovative and impactful. For me, the tension between those qualities is important. How do you want the pavilion to make visitors feel? The experience is immersive and emotional. We wanted to connect the visitor with nature and ecosystems on an experiential level. An important strategy was to configure the site as a whole, with different places, routes and transitions. Within this, we aimed to provide multiplicity, so visitors can curate their own experience of the pavilion as an active participant. Use of the senses was also key. We’ve created something that will engage through sound, taste, touch, smell and sight. How did you feel when you heard you’d won? Excited and proud to be an artist representing the UK on such an enormous platform. The European Union chose experience designers BRC Imagination Arts to develop a series of activities to showcase EU agricultural policies, research and development global food assistance. BRC came up with a family-friendly experience with two animated characters at its heart; Sylvie, a scientist and Alex, a farmer. What’s the aim of the EU Pavilion? Since its inception, the EU has been about bringing people together around a common idea and common policies. 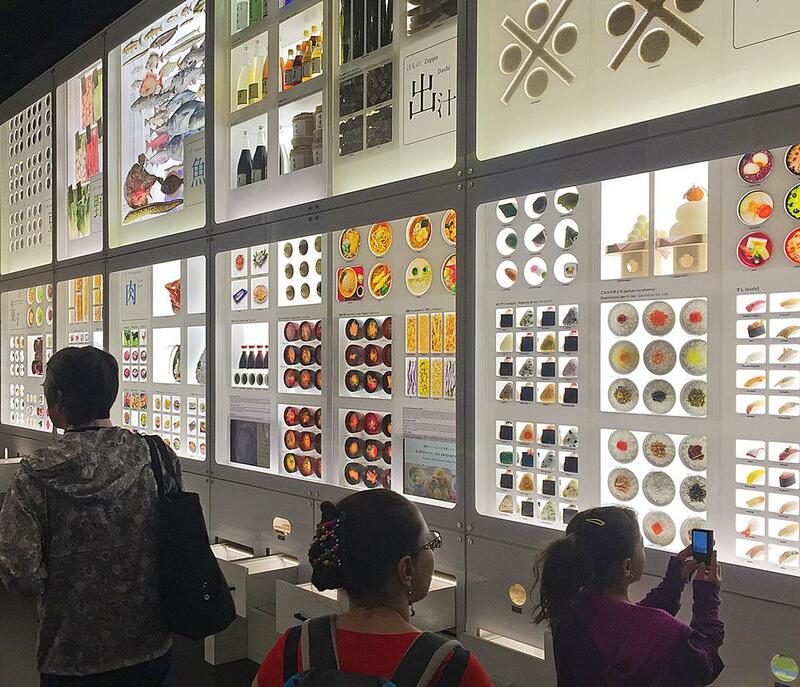 Because the Expo is about feeding the world’s population, our story features agriculture and science working together to solve some of the biggest issues we’re facing today. We’ve got to pull together to address global hunger, food safety, nutrition, sustainability, the environment, and climate change. The story of Sylvia and Alex offers an engaging and entertaining way into these serious issues. Europe is leading the way in best practices, and experiencing how those practices improve the lives of characters they come to care about helps visitors take in those ideas in a way that resonates with them emotionally and sticks with them after they leave the Expo. Can you talk us through the experience? We’ve created a really fun story about two animated characters: Sylvia, a scientist, and Alex, a farmer. In the queue, we follow both Alex’s and Sylvia’s families through a series of photos and mementoes; the family stories develop alongside the birth and growth of the EU after World War II. In the pre-show, we enter the storybook world of our characters. The story comes to life through projection mapping, LCD media screens, dynamic audio, and other techniques. 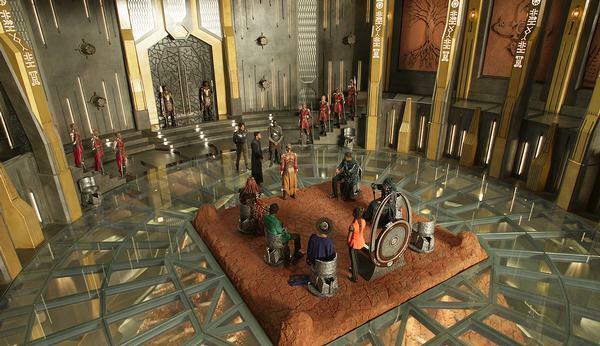 The main show features an animated 4-K film and dynamic theatre effects, including a platform with vibration floor speakers. 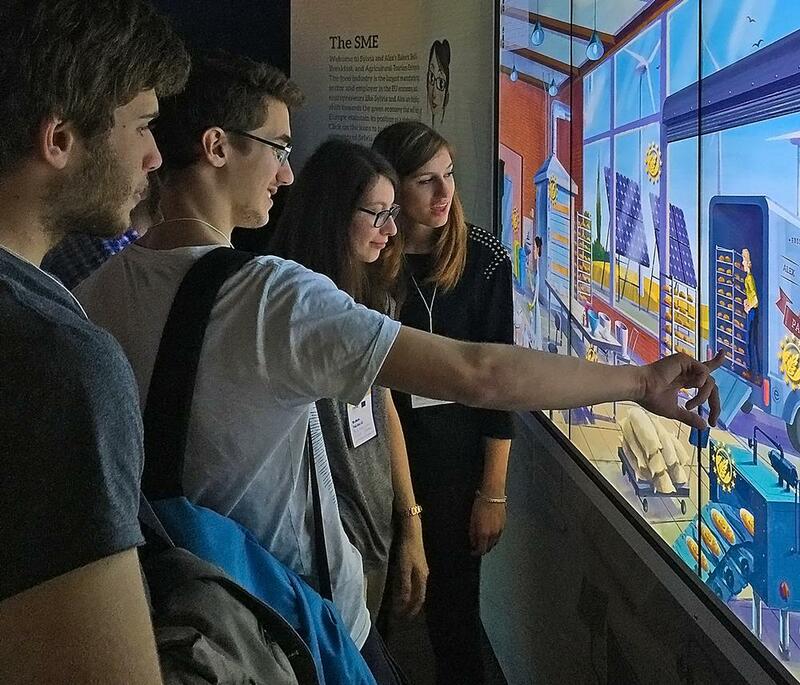 Guests exit the film into the content centre, where they can learn what happens to Sylvia and Alex after the film, and explore key messages by interacting with three custom touch screen storybooks and games. 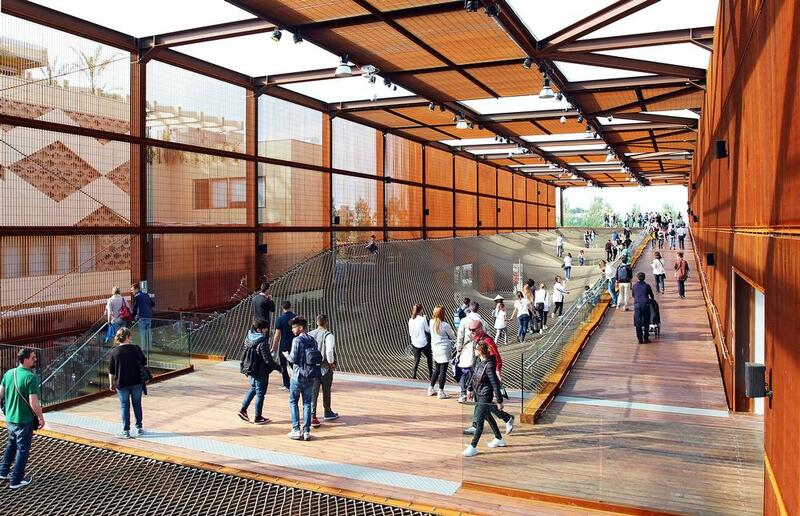 The Italian Pavilion, the only permanent structure on the site, has been designed by Nemesi & Partners, who worked with engineers Proger and BMS Progetti and sustainability consultant Livio De Santoli. It features a ‘smog filtering’ façade in the form of special cement panels designed by Italcementi Group. The design of the façade was inspired by branches in a thick forest. 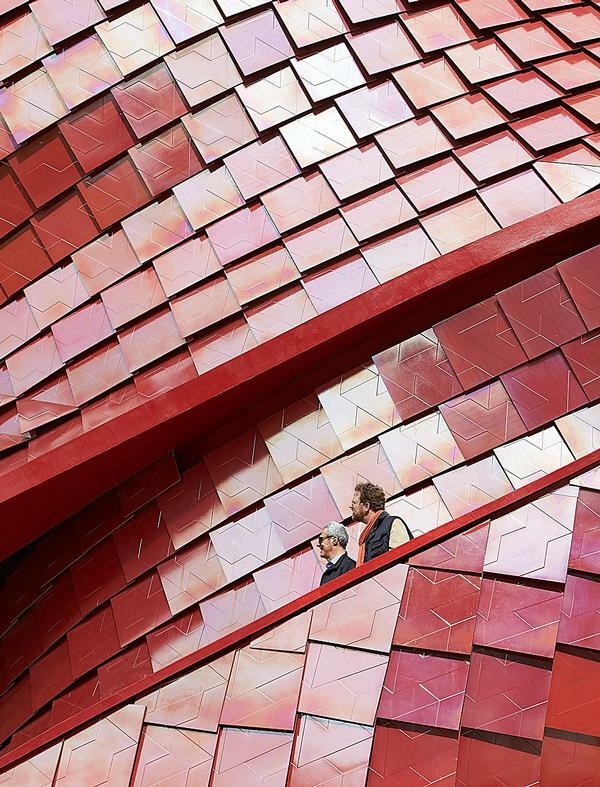 With its shimmering red ‘scales’ and dynamic, twisting form, the Daniel Libeskind-designed Vanke Pavilion is probably one of the most widely recognised images from the Expo. Libeskind was enlisted by Chinese developer Vanke to design its 1,000sq m pavilion. Libeskind has designed a curved building clad in shimmering red tiles with a large opening leading up to a rooftop terrace. Two spiralling staircases ascend the building, serving as both circulation and seating. Inside, exhibition designer Ralph Appelbaum has created an exhibition centred around the idea of shitang – or table – and its role in Chinese society. 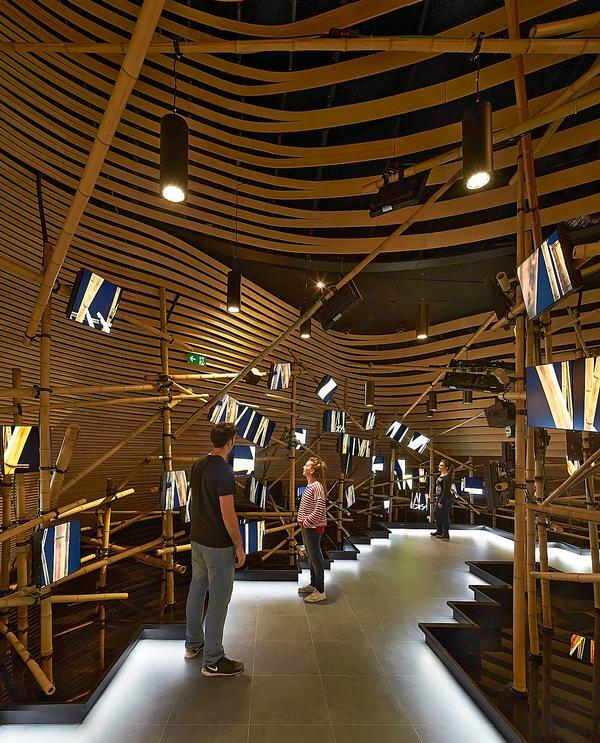 The main space features a ‘forest’ of bamboo stems – resembling a giant game of Kerplunk – with 200 screens attached to the stems showing short films depicting the importance of food in the lives of ordinary Chinese citizens. At the end of the Expo, all of the pavilion’s steel elements will be collected and reused. 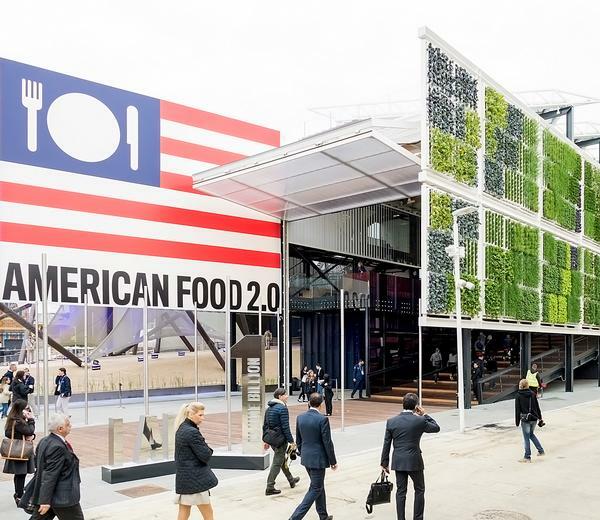 Titled American Food 2.0: United to Feed the Planet, the US Pavilion consists of a simple rectangular barn-like structure featuring a giant vertical farm planted with vegetables, grains and herbs. 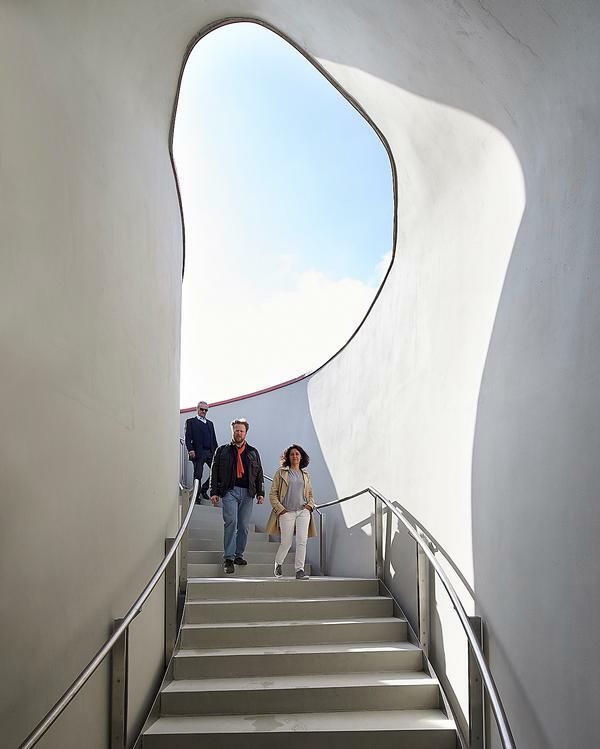 Visitors enter Biber’s pavilion via airplane hangar-sized doors, where a boardwalk (made of lumber recycled from the original Coney Island boardwalk) rises to the second floor. The main exhibition space is on the ground floor, and will host art exhibits, readings, concerts and other cultural events. A rooftop terrace features a translucent floor and energy-generating panels. Outside, a food truck serves regional American street foods. Where did the inspiration for the design of the US Pavilion come from? American agricultural buildings, Coney Island Boardwalk, the first Expo building (Crystal Palace, London, 1851), the long narrow site, America’s love affair with the road and the aspirations of America to be transparent, open and accessible while offering freedom of choice. We wanted to create a scaffolding for ideas, a social space, a pavilion that could be experienced in multiple ways, and one that was never blocked by a discouraging queue out front. The pavilion was to be an invitation to enter, not a fortress protecting the interior. The building is quite simple in design. Why was this important? Having spent time at a number of other pavilions I’m more convinced than ever that we did exactly the right thing in creating an open, free flowing, breezy building that can be understood in an instant, but experienced as a rich sequence of events. The simple elegance of the formal idea (a long open extrusion with a rising ramp and grand exit stair) allowed us to concentrate our resources on the things that matter. A complex form would have precluded that. What were the biggest challenges of designing this pavilion? 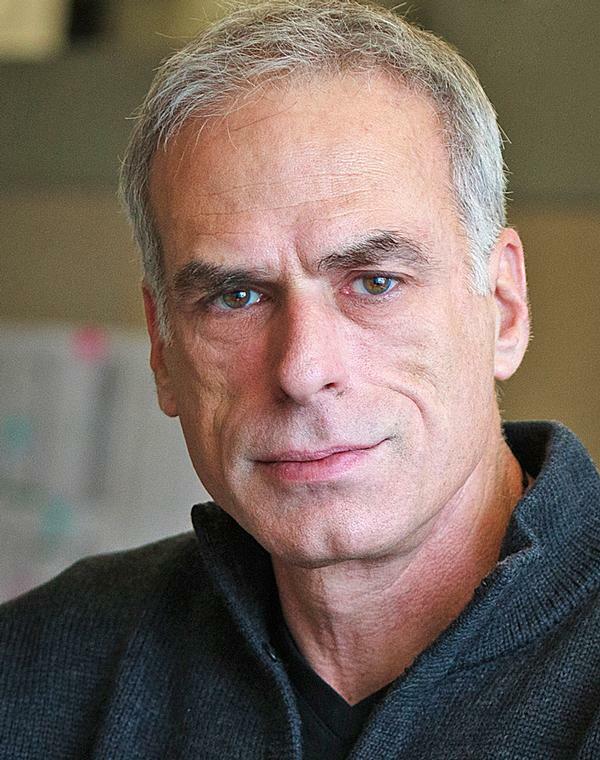 Time, money and the restrictions of the context (just like any other project). We also invented some architectural elements that had never been done before, such as the vertical farm façade in motion, and individually addressed digital roof array, and required custom solutions that had to work perfectly from day one. We didn’t have an R&D budget or years to develop these elements, but had to invent them on the run. 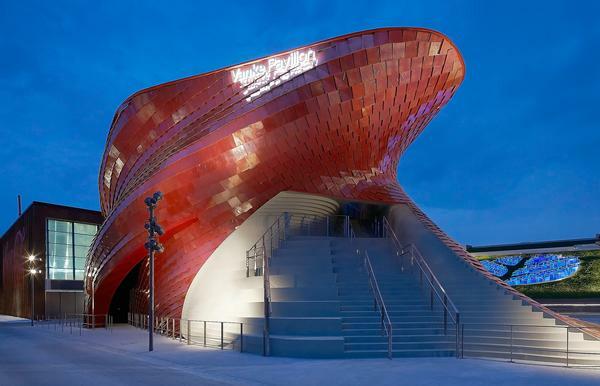 There have been criticisms that the Milan Expo is wasteful and is a vanity fair. What are your thoughts on that? Jacques Herzog was nearly 100 per cent right in his original plan. It was a brilliant and logical way to undo much of the waste at an Expo. He was right except for the fact that no one would participate in that version of an Expo. Expo is the design Olympics, and tucking a few temporary sheds under a tented site would not satisfy the participants’ need to express their national identity in an open and competitive forum. 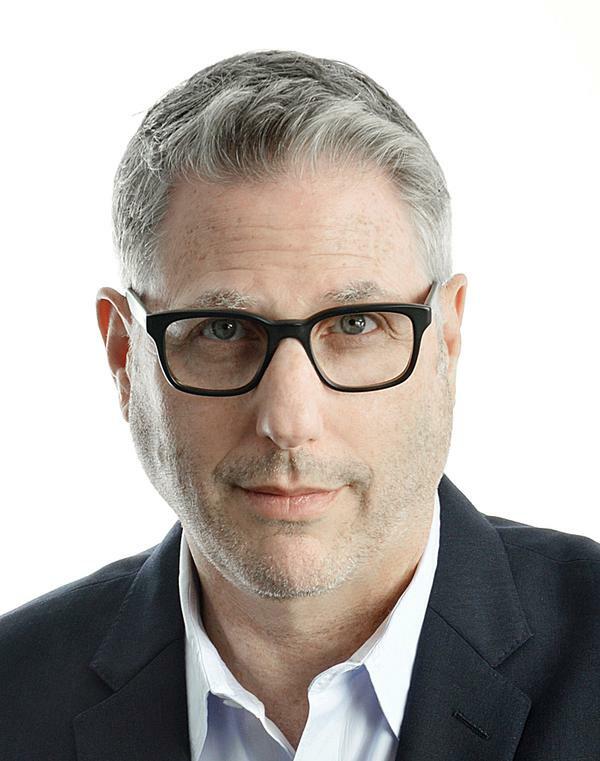 This Expo may succeed in raising issues for a global conversation, and that would make it enormously successful. What is your favourite pavilion at the Expo other than your own? Pavilions I admire include the Bahrain pavilion (a small, domestically-scaled pavilion, beautifully crafted and simply arranged. plus no queue! ); the UK pavilion (one idea, elegantly executed); the Austria pavilion (a complete forest in a straightforward rectangle); and the Future Food Pavilion (a working co-op supermarket). What did you want to achieve with the US Pavilion exhibition design? Global food scarcity is becoming an enormous and very interesting issue. We think the United States has a great story to tell about the innovative research and different communities of expertise working on these issues. We want to present this not just as a problem but as an opportunity. It’s not just about solving the problem of population growth, it’s about harnessing human energy and having a planet that’s healthier than the one we were born to. Can you talk us through some of the key features of the exhibition? We begin with a soundscape that comes from the indigenous Native Americans, giving thanks for nature’s bounty. Then a chorus of other American voices connected to the land, including a farmer, pick up the story. Visitors then move up the step ramp to the middle floor, or boardwalk. Outside the pavilion, a magnificent two and half acre vertical farm features crop plants growing on big pivoting panels that are positioned to capture sun. We’ve brought some of these plants inside; exhibit stations spiral upwards, and are topped with ‘chandeliers’ growing the plants. The stations have screens attached, with each presenting a different perspective on global food scarcity. In the centre of that is an interactive exhibit that six people can play at any time – it brings all of these threads together. We also have a rooftop terrace which has a view of the whole expo site. It’s primarily a place to decompress and it also acts as a space for special events. On the ground floor we have the Great American Foodscape, which is a landscape of folded forms that have videos projected onto them telling the story of American history and culture through its food. What do you want people to take away from their experience? I want them to feel they know Americans a little better; to know that we’re a country of diversity that likes to invent and to solve problems. I love World Expos. I’ve had the opportunity to work on four BIE events: the Aichi Expo 2005, Shanghai Expo 2010, Floriade 2012 and now the Expo Milano 2015. World expos are magnificent parties designed to bring people together from around the world to produce new ideas, new thinking and new solutions. Of course you’re here to do more than eat. Here’s my quick list of what to see and do at the Expo. 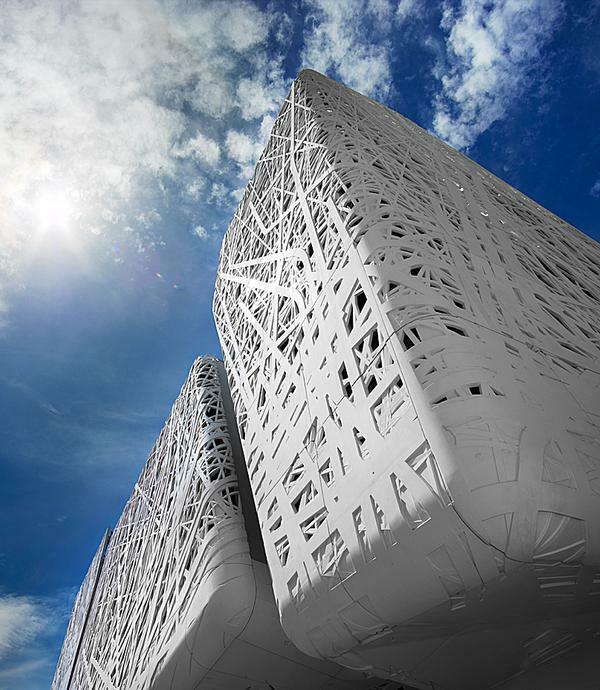 • The Italian National Pavilion with its gorgeous white façade. • The UAE Pavilion Norman Foster's pavilion is high on the list in terms of quality. • The UK Pavilion A simple, elegant statement, beautifully designed. I’d recommend visiting in the evening. • The Austria Pavilion All of the elements inside and out are simple, elegant and informed by the natural world. • The France Pavilion elegant in form and structure. • The Tree of Life A wonderful sculpture that comes to life with music, water, colour and effects. It's a big hit with Expo visitors. • Pavilion Zero Epic in scale, story and presentation techniques. • German Pavilion A great experience from exterior through the finale show. It incorporates exciting new technology, and the end experience is full of energy and music. It’s wonderful! • Korea Pavilion Artistic installations, beautiful projection and choreographed robots. What else do you need? 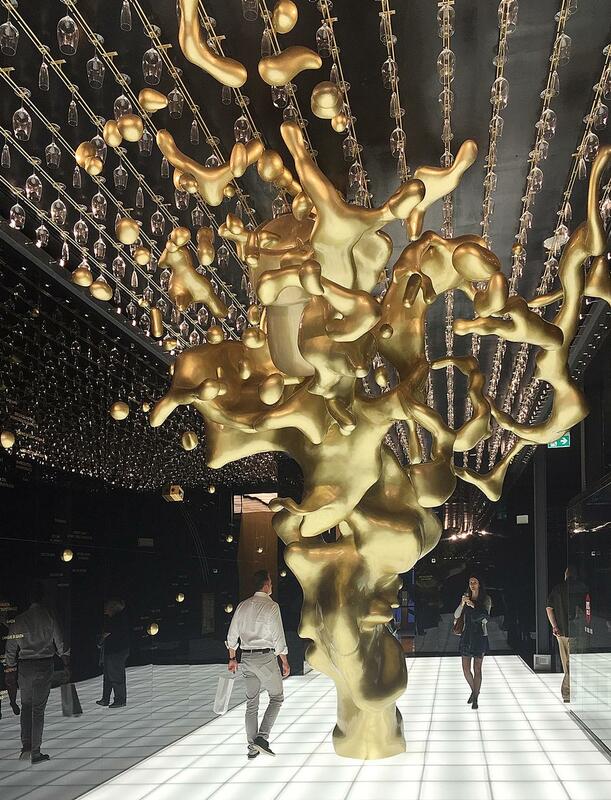 • Japan Pavilion Audacious bordering on bizarre, but artistic. Here you’ll find immersive projection worlds you can explore. The finale show blends Iron Chef with virtual dining experience Tokyo style. • UAE Pavilion A touching story presented with a variety of media-based presentation techniques. Don’t miss the Expo 2020 Dubai preview centre. • Kazakhstan Pavilion A surprise. The first artistic show experience is worth a visit. • Argentina Pavilion A wonderful projected world. Don't miss the amazing live performance stage. It will get your heart pumping and make you feel alive. This is a global party where we come together from around the world to celebrate the great mission we share: the commitment to find new and better ways to feed the world, eliminate waste and create a global food culture that is abundant and sustainable. All countries were asked to build their pavilions in a sustainable way, where they can be easily disassembled and recycled. In Milan, certain Italian pavilions will remain on the exhibition site after the Expo is over, such as Palazzo Italia, which will become Milan’s centre of technological innovation.